In the Spring of 2006 I got tired of my gray hair that made me look older, and I got tired of the round lenses that made me look like Harry Potter. I also received a sample tube of lip gloss as I strolled around the make-up counter at the mall on the way to the hot pretzel vendor and the rest, as they say, is history. 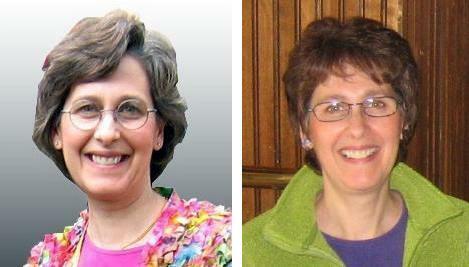 The picture on the left was taken at Jen’s graduation from college in April 2006. The picture on the right was taken in October at my 30th college reunion. I feel like I have an entirely new head! I must say the glasses were easy to get used to. The new hair, not so much. Never having met Miss Clairol before, I am amazed at the maintenance regiment this deceit requires. I can’t use my vast collection of hotel shampoos anymore. The color will fade. Naturally the one the salon sells is so expensive (compared to “free”) that it must have gold flakes mixed in. Then there is the conditioner, volumizer, sculpting goo, and fixative. Deception aint’ cheap. Who knew!? I do have one beauty tip I discovered on my own. When the gray starts to poke out at the roots around my face I can do my own touch up. No kidding. With a little experimentation I discovered that a permanent, wide tip, brown Sharpie marker is a pretty good match to the secret potion my hairdresser mixes up in the back. Just don’t hit your face with the marker on the way to your hair. Takes about three days to wear off your face. Hopefully longer on your lovely locks. Entry filed under: Miscellaneous Musings. Tags: Ami Simms, deception, getting rid of the gray, hair dye, new use for sharpie marker. You’ll have to do my eyebrows for me. No way I could draw a straight line. Not to draw a line (I couldn’t do that either), but to cover the emerging grey hairs that come up here and there. Oh, sorry. I was just trying to get out of using the Sharpie on my eyebrows. Not gonna happen. My luck I’d hiccup…. Think I will stick with the grey which still has layers of colour after a trim. Better use for a Sharpie … if you don’t like re-threading your machine always use white thread, then run a pen in a matching colour to the fabric along the seam line. Thanks for the tip, but I think I’d rather change thread. I haven’t had found that many colors of Sharpie. Love the sharpie idea! Unfortunately I have the opposite problem, blonde hair growing in very dark, need to make it lighter. Costs a lot for highlights at the salon, wish I had a blonde sharpie! Kelley, I can’t believe the hair dye people haven’t figured out a way to do this better than a Sharpie. Who would have thought of a sharpie!!! Thanks for the tip. So happy to help, Marie! You look great. I did not know you colored your hair. Whoever does it does a great job. You always look so young — and we know how energetic you are! You look beautiful Ami! BTW, there are lots of shampoos and conditioner made especially for tinted hair, and they are not salon prices! Look in Target if you have one. Nancy, I’m sticking with Ms. Clairol for a while. I’m not ready for a new look again so soon. Moderation? Is it too racy? Mascara on the bangs? Easier to apply, but I’m not crazy about the running either. Amazing! I had kiddingly asked my hair dresser if I could use a sharpie & he said yes but I hadn’t tried it yet! I LIKE the “new” you! Alicia, happy to product test. Lucky you – my grays come back in such numbers that it would take all day to get them with a Sharpie. Fortunately, my color is dark enough that I can get away with using my mascara on the grays. Box of “Do-it-yourself Haircolor” = 1 yard of fabric. “Professional Haircolor” = whole quilt top of fabric. “FYI” – No haircoloring = more sewing time! I always bring a basket of stuff to do and she’s FAST! You’re always young when you smile and have a sense of humour, Ami, so you pass! I agree with Kelley (#7) that blondes have more problems staying blonde, and the Go Blonder shampoo is over $7.00 a tube! But I had to prove to my mom (slight dementia and mixed me up with my sister, I’m sure!) that I wasn’t trying to fool anybody, and was REALLY a blonde — tends to sneak up on you (like weight) and my Guild members said my hair was “light brown” when asked! :-p LOL re: the whole Sharpie thing (esp. the thread)! Glad I pass, with laughs! Everything is sneaking up on me these days! Not just hair color, wrinkles, jowels…don’t get me started! Speaking of office products to ‘deceive’ others… My daughter uses “White-Out” on her white car to cover up door dings and the loss of paint on plastic surfaces. Those bumpers just don’t hold their original paint so swell after 15 years. As long as the engine and AC work she won’t part with car payment money. Wanda, doesn’t “white out” wash off?! Steve paints our 2001 Venture van every summer with black rubberized rust-proofing type paint to cover the rust and rust holes on the sides. Looks pretty good until you get close enough to touch it. Nancy, I just started my deception…I’ve got a few more years. Thanks! That’s so nice of you to say. Singing now: “I feel witty! Oh so WITTY! I feel witty and……(forgot the rest). Shutting up now. You might never come back.